Sea urchins look like fluffy pincushions that scavenge on the ocean floor. They are part of the same family as starfish, and there are more than 800 species of sea urchin. With females releasing millions of eggs at each spawning, it seems the ocean should be overrun with urchins. However, they often become tasty treats for other fish before making it to maturity. 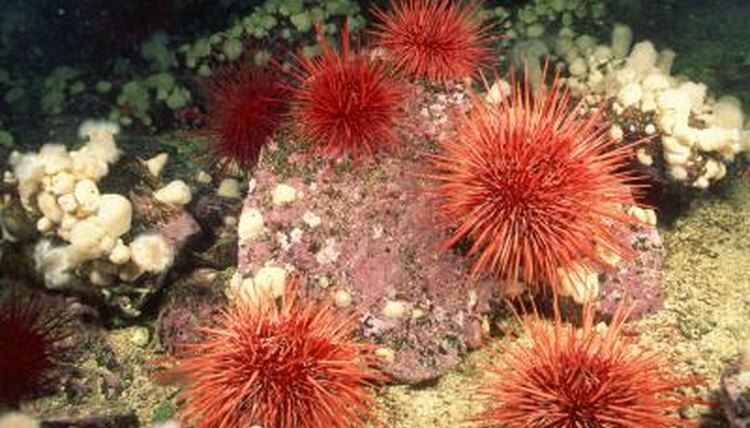 Sea urchins typically spawn near the surface. Males release sperm into floating plankton, then female urchins release between eight and 20 million eggs in the same area.The jelly-like coating on the eggs attracts the sperm, and when the two meet, they create an embryo that starts dividing into new cells within minutes. Within a day of fertilization, the embryo becomes a blastula. In this stage, he sheds his egg sac to reveal a group of cells covered in cilia that help the embryo swim. They can't swim well enough to leave their plankton field, however. Instead, they become part of the plankton and add a protein-rich component other fish can enjoy for dinner. The blastulas that aren't eaten continue to develop, starting with digestive systems. The embryo starts to elongate, moving into the larval phase about three days after fertilization. The larvae, or pluteus, continues to live with the plankton while he grows spiny structures on one side. If the pluteus can survive more than a month with the plankton field, he grows large enough to sink to the ocean floor. He normally has a bud starting to grow on one side by this point, usually around 45 days. This bud develops small spines and tube feet, continuing to grow and drain energy from the pluteus for about a week.The bud grows into a miniature version of an adult sea urchin, disconnects from the now-defunct pluteus skeleton and starts his search for food. He might look like a sea urchin in less than two months, but he's far from mature. Sea urchin offspring can take up to six years to reach their full maturity, during which time they must look out for predators such as starfish and sea otters. They can defend themselves a little bit, using tube feet and spines to move away from predators or pinching predators with their mouths. This isn't always successful, but if a sea urchin survives to be five or six years old, he's ready to release his own sperm into the water and create offspring of his own.